CINCINNATI — April 30, 2018 – ProAmpac, one of the nation’s largest and fastest-growing flexible packaging manufacturers, is exhibiting at the Association for Dressings and Sauces Technical Meeting (ADS) this week in Charlotte, N.C.
With a growing portfolio of advanced packaging options, ProAmpac will debut their newest condiment packaging innovation – PACKETLAM™- which offers excellent barrier properties, can increase line speeds, and includes a non-foil alternative. 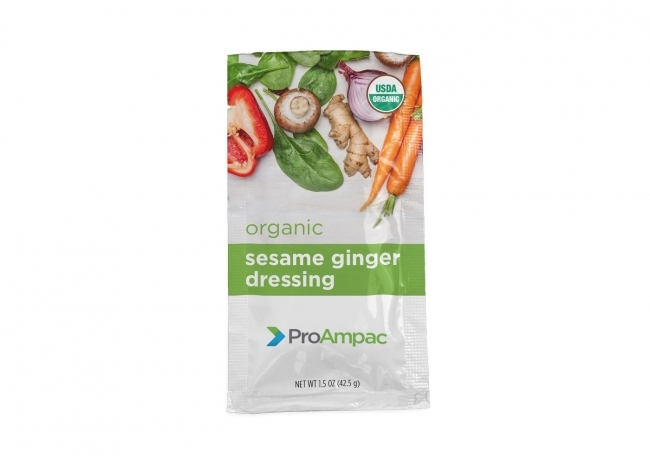 Along with their condiment films, ProAmpac will demonstrate their vertically integrated lidding capabilities, including daisy-chain roll form materials perfect for single-serve salad dressings and on-the-go condiments. “ProAmpac is answering the increasing demands for single serve and on-the-go food with world-class innovative solutions. We are proud to offer customers integrated and comprehensive flexible packaging capabilities,” stated Adam Grose Chief Commercial Officer for ProAmpac. ProAmpac is a leading global flexible packaging company with a comprehensive product offering unparalleled in the industry. It provides creative packaging solutions, industry-leading customer service and award-winning innovation to a diverse global marketplace. The company is guided by four core values that are the basis for its success: Integrity, Intensity, Innovation and Involvement. ProAmpac is a member of PPC Partners, which owns and operates market leading companies in the manufactured products, services and healthcare sectors. For more information, visit proampac.com.